This veggie meatloaf is a delicious alternative to ground beef or turkey. This super moist meatloaf is packed with veggies - even your pickiest eaters will approve! Puree the first 4 veggie ingredients into a smooth paste and transfer mixture to a large bowl. Add beef, oatmeal, ketchup, and salt and mix with your hands until well blended. 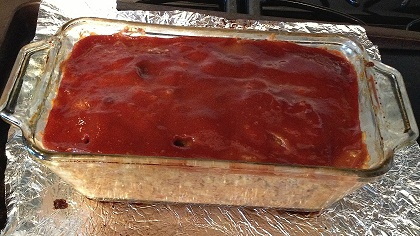 Transfer to a sprayed meat loaf pan. Combine topping ingredients and spread over top of meatloaf. Bake at 350 degrees for approximately 1 hour or until the internal temperature reaches 160 degrees F and cooked through. Let stand 5-10 minutes before slicing and serving.